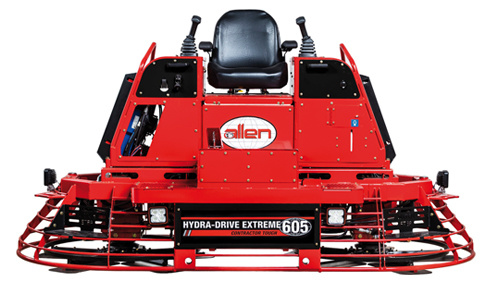 Allen recently announced the debut of their new HDX605 Riding Trowel. The HDX605 is a hydraulically-controlled, 8’ class (2.6 m) ride-on power trowel that is powered by a powerful Kubota gasoline engine. The HDX605 was designed with the high volume flatwork concrete contractor in mind. This riding trowel comes with cruise control, digital readouts for accurate fuel levels and diagnostics, and a large 49 l fuel tank for longer run times. It is also equipped with powerful pumps that help maintain excellent torque even at high rotorspeeds. This makes the machine excellent for panning or finishing operations. 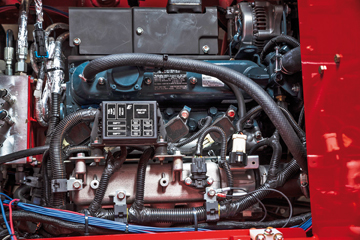 The HDX605 also features a 57 hp Kubota WG1605 gasoline engine which is a lower cost alternative to a T4f diesel engine. Allen Engineering Corporation, headquartered in Paragould, Arkansas, is a family-owned company. It designs, engineers, manufactures and markets concrete and related equipment with the number one goal of Total Customer Satisfaction.